Gapers Block - To be Demolished: 6625 S. Martin Luther King Jr. Dr.
6625 S. Martin Luther King Jr. Dr. Permit Description: Wreck and remove 2 story brick structure. 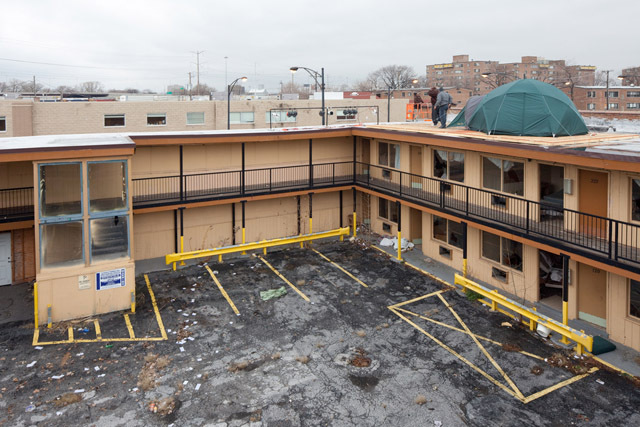 Pastor Corey B. Brooks of the South Side New Life Church made a public plea to demolish this former Super Motel, vowing to remain on the roof until $450,000 could be raised for the demolition and site planning. The motel was part of a collection of modern motels on King, and was in operation until recently. It received a permit for renovation in 2008 and two more in 2007 but, as can be seen above, was all but abandoned before the church acquired the property. The pastor rode the scissor lift to the sidewalk for the last time in February after raising the money from hundreds of small donors -- and large contributions from an anonymous benefactor and Tyler Perry. Now that the building is demolished, the pastor is raising $15,000,000 for a new mixed-income, mixed-use "community center." He has currently raised just over $100,000.